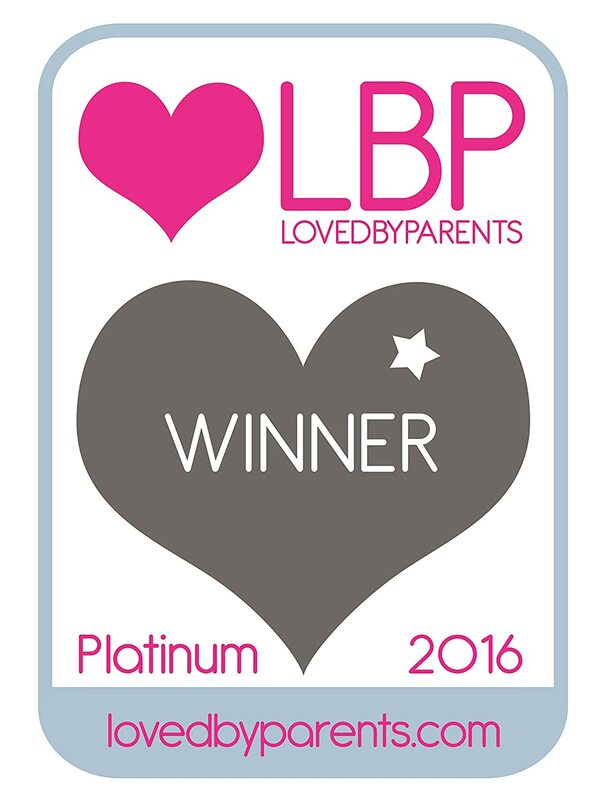 Entertain and stimulate your child's senses with the Tiny Love Meadow Days Super Play Mat. 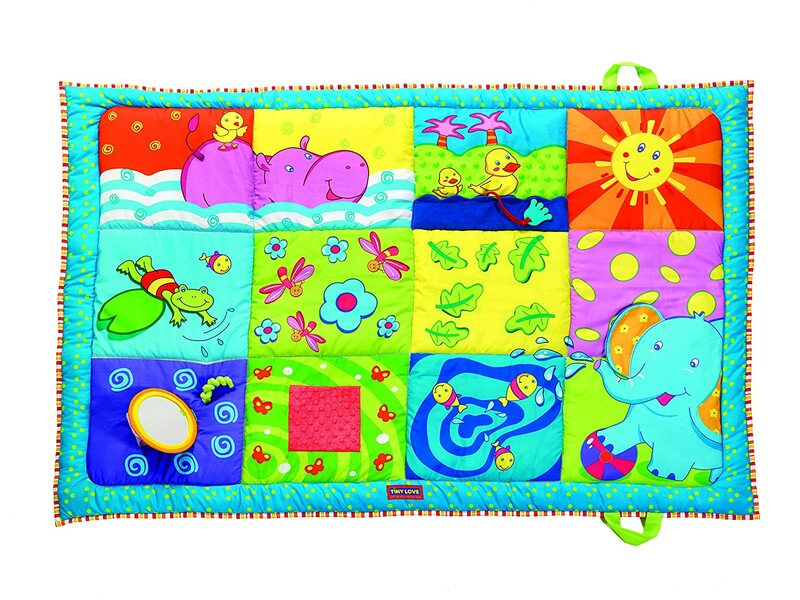 Providing a developmental playground of fun activities and discovery indoors or out, this extra-large play mat is built on plush padding to provide comfort for baby and parent alike. 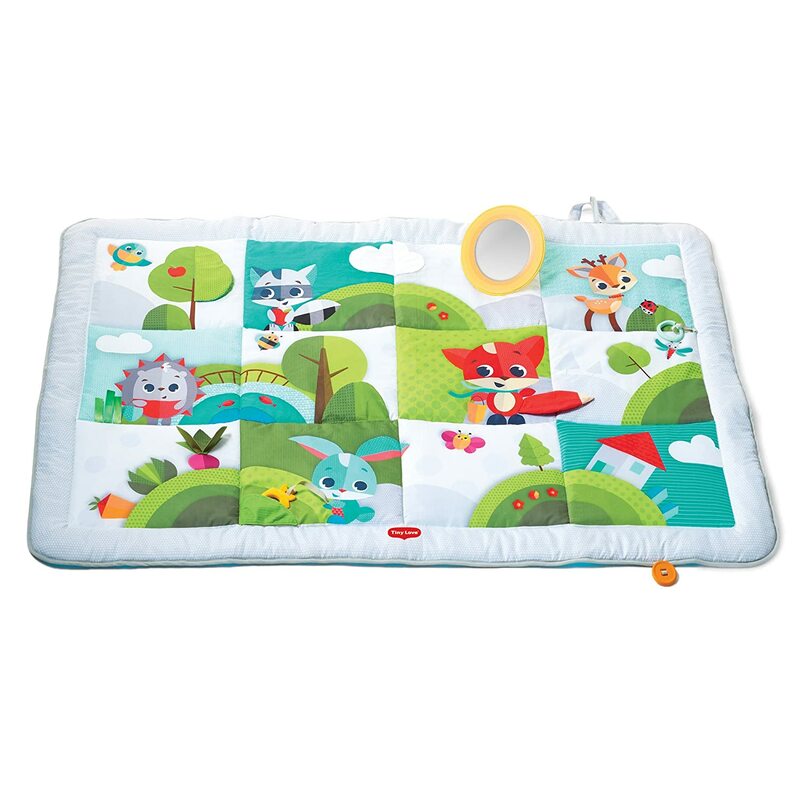 The play mat features fun and engaging textures for tactile and motor development, plus a padded mirror to promote facial recognition and continuous engagement. A cute carrot teether provides healthy, natural development and soothing for baby. 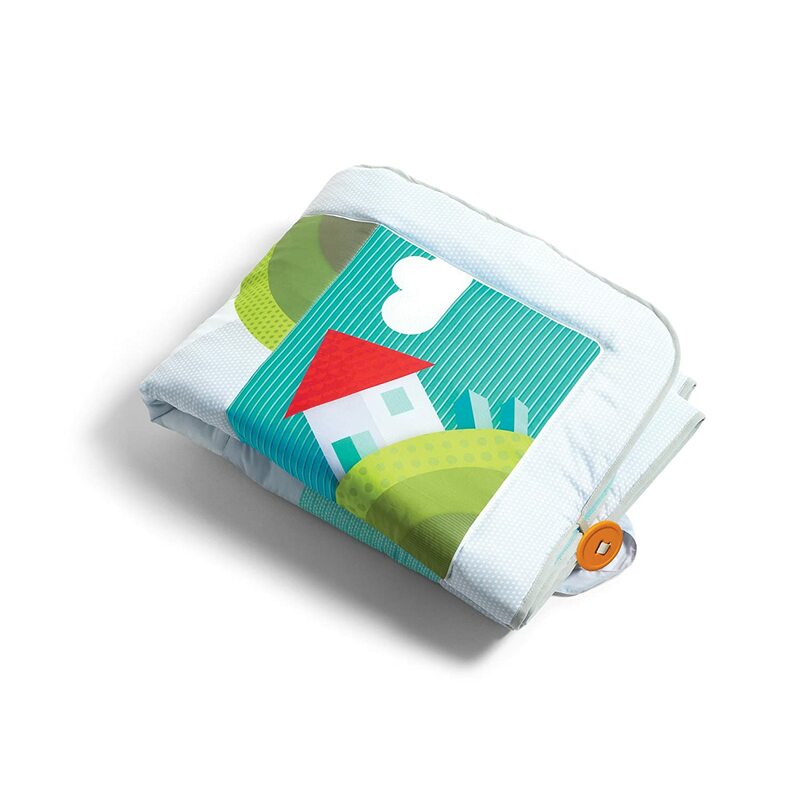 Fold the play mat up quickly and easily for compact storage or travel. 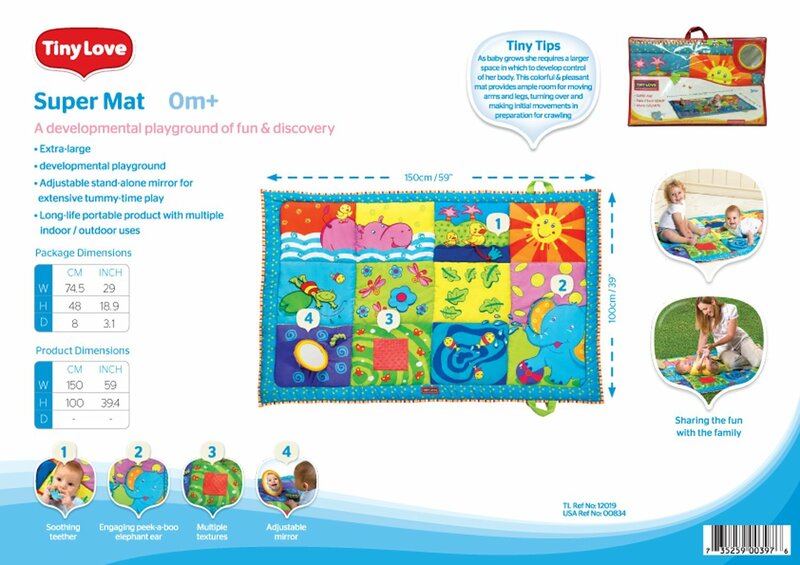 This JPMA-certified play mat meets ASTM and federal safety standards. Tiny Love strives to identify the latest discoveries in child development and translate them into engaging, interactive baby toys that nurture skills and delight the senses. I was all ready to give this mat a perfect score when yesterday the squeaky toy built into one of the panels broke. Now it makes no sound and we've only had it for a couple of months so my newborn barely got to appreciate that feature. Furthermore, the texture isn't great for learning to crawl. It's too slippery and makes it hard on the little guy! I love this play mat! It is exactly what I was looking for - plus more! 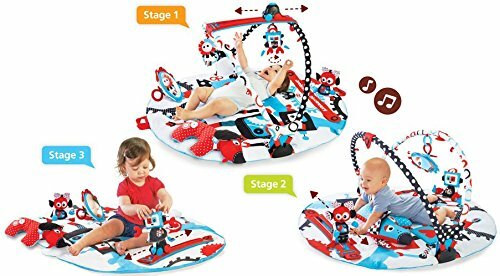 I wanted a soft, padded play mat (something thicker than just a blanket) so my newly-crawling baby could practice his skills without bonking his head on the floor. This is perfect. 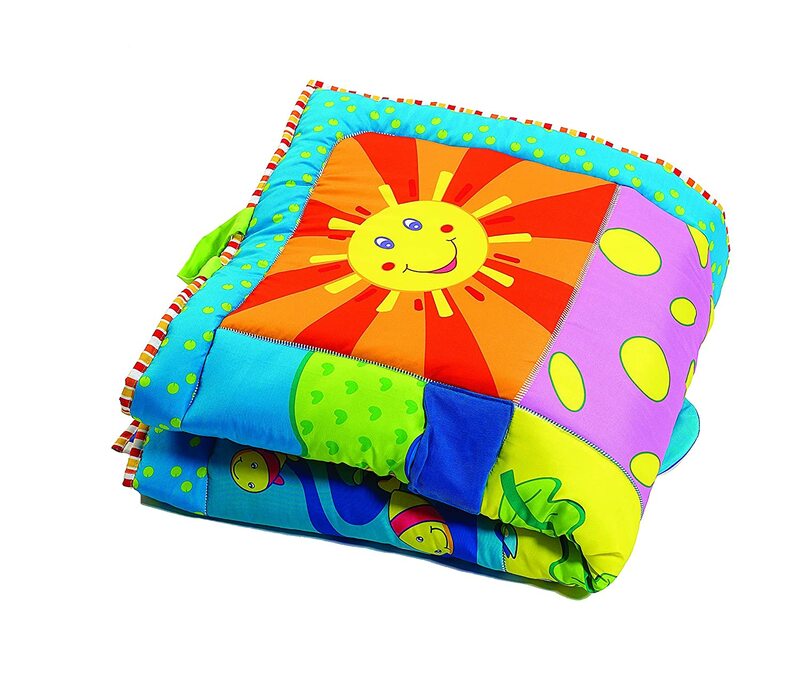 It has nice soft padding, and is large enough to give him a lot of room to crawl and roll around. I was in a rush when I ordered this, so when it arrived I was pleasantly surprised to see that this play mat actually comes with toys! 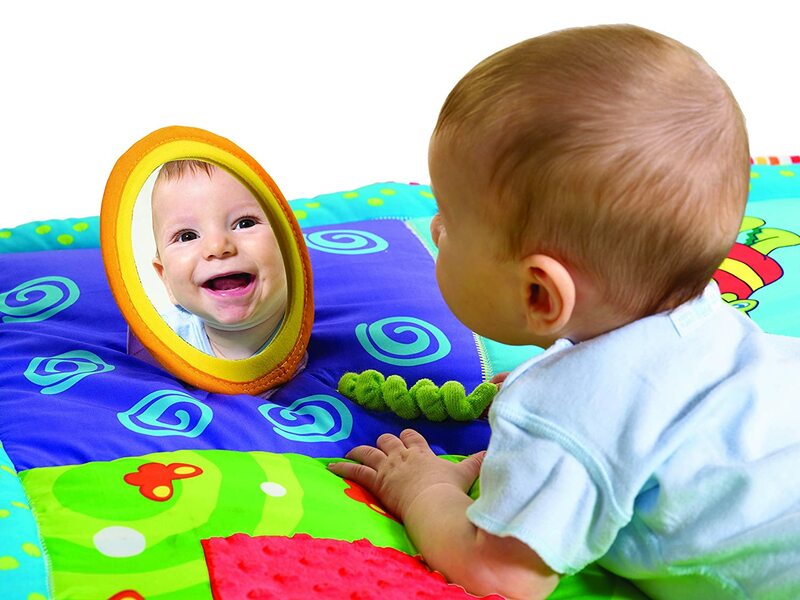 There is a mirror, teether, textured surfaces and crinkly toys. It's really fantastic. The mirror & crinkle toys were a big hit with my son. I would recommend this to anyone with a crawling baby. I LOVE this mat! 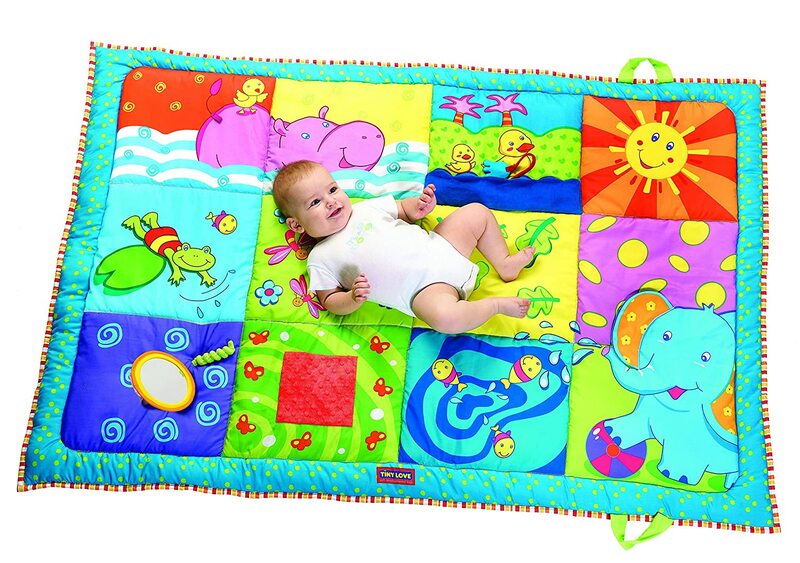 I have been looking for a large mat for my 4 month old so he can practice rolling and this mat is a home run. Itu2019s padded thickly, perfect for our hard wood floors, and large enough that I can sit on it with him. Itu2019s really brightly colored and has interactive crinkles and hooks to attach toys. Iu2019ve washed it in the washing machine (air dry) several times and itu2019s held up great. I saved the plastic wrapping it came in so I can pack it up and take it with us. This mat offers just the right amount of cushion and also stays in place well. It's a great size for my 8 month old who enjoys the different textures and colors. I am including a picture of her touching a flower pattern that she was in awe of for the first 10 minutes. I was hesitant on spending $30 on a playmat but I'm glad I did. This is very cute and it's big enough for the baby to roll over and try to grab different toys. 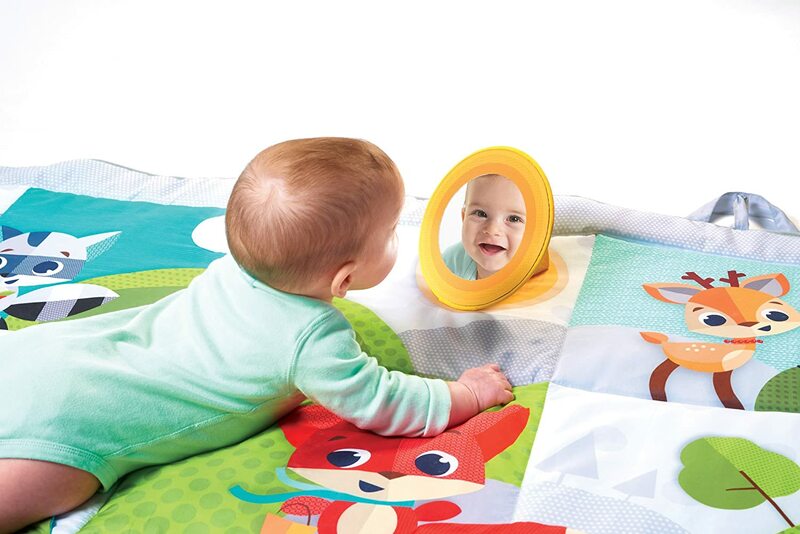 We place two mirrors because we had one from a Tummy-Time mat and he loves looking at himself. There are a few things tat will entertain the baby. Two of the baby's favorites are a little tail that you can pull into a small tab and the crinky water. He held onto that little tail to help himself with rolling, it was very fun to watch. The crinkly water he just likes the sound and touches and touches it for a while. There are other features, like a hidden horn and a peek-a-boo elephant ear. He hasn't paid much attention to it. Overall, I like that the baby is not on the floor, he has his own space where I don't worry about him getting carpet burn. It's colorful, machine washable and it's made of some sort of synthetic fiber so it doesn't fade in the wash. I did not put it in the dryer because of the cellophane pieces and a toy with a leaf that is plastic attached to it, but it dries fast line dried. We love this mat. I originally was considering a foam mat but many complained of a bad smell. Also I'm pretty sure my cats would ruin it in no time. I found this mat as an affordable alternative. The mat is nicely padded, large, and has a nice backing so it stays put and doesn't bunch up or slide around like a blanket would. The colors are bright and my son loves the animal faces. He smiled the first time he saw it. The different textures are a nice bonus, a minky square, courdoroy pocket, and crinkly parts. I appreciate the extra loop for adding our own toy. This way I can switch it easily with something new. I do machine wash and hang to dry inside and as others have noted it dries quickly. I own six paneled plastic play pen. When set up in an octagon this blanket covers most of the center. When set up as a rectangle it covers nearly all with just a couple inches left on the long end. We use this so much it gets moved around the house a lot. I know moving a foam mat would have been a pain. This is easy. So I contemplated for like 2 weeks buying this and Iu2019m so glad I finally did. I have twins and every play mat is way to small and this is the perfect size. 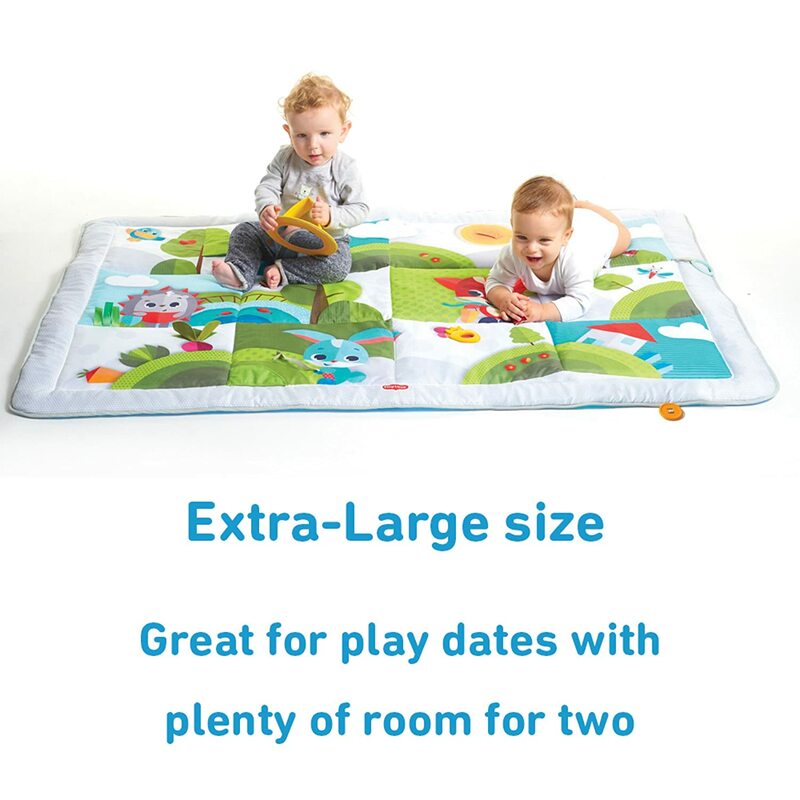 It's large enough for them to both play and not be crammed. We have hard wood so I wanted something with some padding so they can really work on their upper body strength and itu2019s just enough. 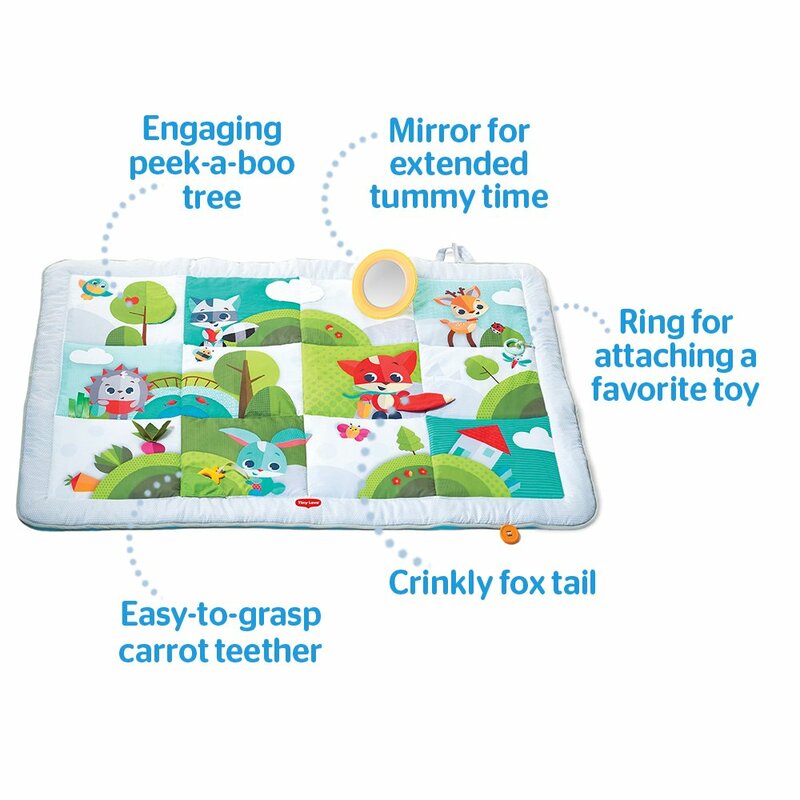 I love that there are little scrunchy leaves and fox tails on the play mat it really helps with keeping them occupied. I highly recommend this play mat! I love this mat! Itu2019s exactly what I was looking for. Something to do tummy time and padded enough that it wonu2019t hurt too much if my girls fall while learning to sit up. 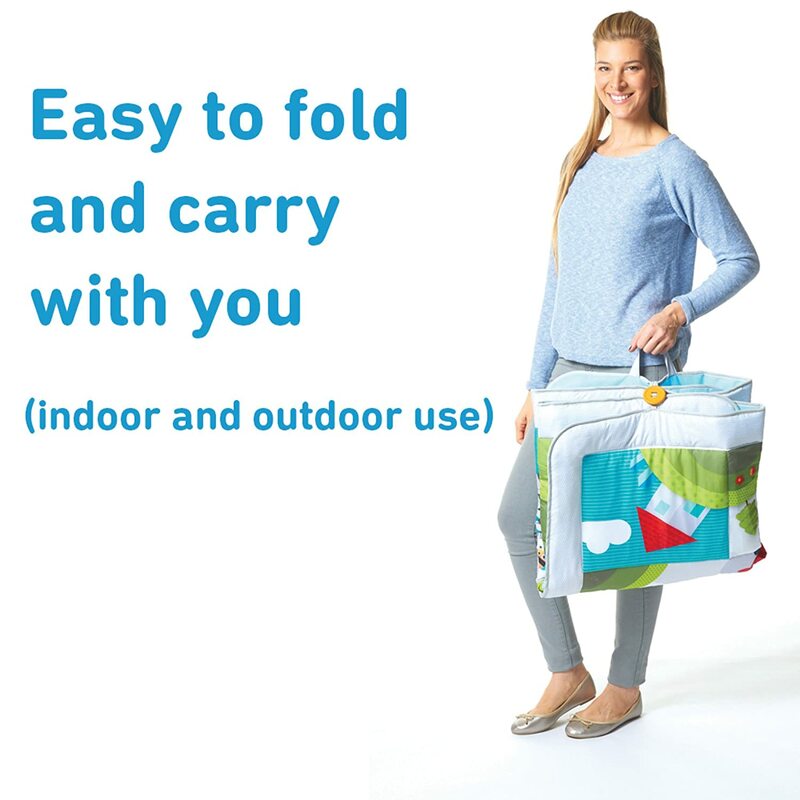 I also love that it can be folded up and taken on the go easy enough. My girls also love the mirror and all the little flaps and such on it. It entertains them.